While the Presidential candidates are including government reform themes in their platforms, are any creating a coherent governing agenda? This was a question raised by Harvard professor Elaine Kamarck in a presentation I attended in April at the Progressive Policy Institute. 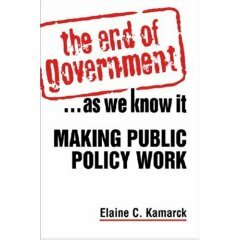 Kamarck, a former Clinton-Gore White House lead for reinventing government, recently wrote a book: “The End of Government As We Know It: Making Public Policy Work” that offers candidates a way of thinking how they might approach governing. 1. Traditional bureaucracy, which relies heavily on hierarchy and defined processes, is good when handling a lot of money and when standardized, routine processes are important. A good example is Social Security. 2. Reinvented government, which looks to private sector best practices and the use of technology, is useful in many agencies that have a lot of customer contact and need to be responsive. Examples include the Postal Service, Immigration, Veterans Health Care, and the Passport Office. 3. Network-based government — which links policymakers, funders, and service providers through a series of contracts or agreements – is useful when no one agency or level of government can deliver the full array of services needed to address a social problem. Examples include public education, social services, and environmental improvement. 4. Market-based government, which creates a market for public services, is used when the goal is to change public behavior and the changes are widely distributed in the population. Examples include the current campaign to reduce obesity, the sale of telecommunication spectrum by the Federal Communications Commission, and state “bottle bills” to encourage people to not litter. Kamarck noted that no single approach works for all of what government does, but defining what works, under which circumstances, will be an important element for the next President’s team. This entry was posted on June 16, 2007 at 8:54 pm and is filed under Transition 2008. You can follow any responses to this entry through the RSS 2.0 feed. You can leave a response, or trackback from your own site.